For the first time Sportingintelligence has published the average basic weekly wages, division by division, of footballers in England for the past 25 years. And it makes fascinating reading. One thing to keep in mind as you are reading the post is that these wage numbers represent basic pay; wages typically increase by 50 to 100% with appearance money and bonuses. In 1984-85, according to the PFA’s data, the average basic wage in the First Division, which was the top division in England then, was £24,934 a year. Bonuses would have pushed that wage up to around £36,000, or about three and a half times the average working man’s salary at the time. 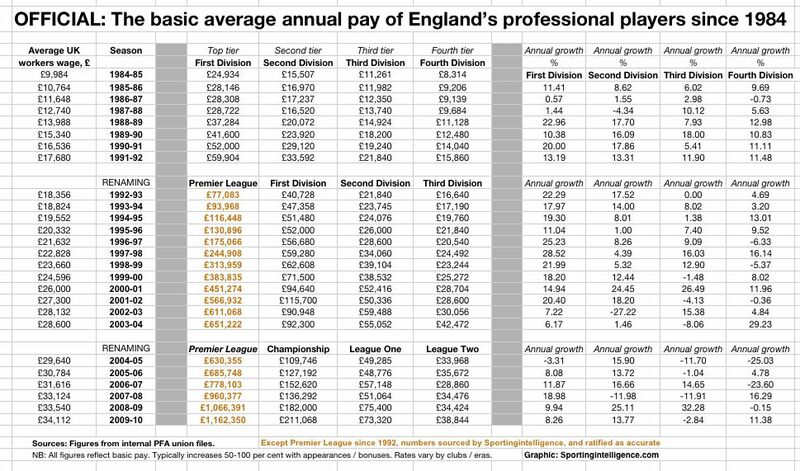 In 2009-10, the average basic Premier League wage was £1.16m and the average take-home pay was £1.76m. Top division footballers now earn 46 times as much as they did in 1984-85 while the average worker earns about three times as much. The jumps in Premier League wages can be directly tied to the growth in TV money. For example the biggest increases in wages took place between 1996-97 and 1997-98 when a new TV deal kicked in. The incredible growth in wages in the Premier League however is not trickling down to players in the lower leagues. Twenty-five years ago the gap between wages in the top division and the fourth division was only three times as much. Today Premier League wages are 30 times higher than those in the fourth division. as much. According to the PFA document, the average annual basic salary in the Championship in 2009-10 was £211,068, in League One it was £73,320 and in League Two it was£38,844.